Architectural interior design company, Black Canvas, recently refurbished Insiava’s offices in Menlyn, Pretoria. The up-and-coming, technology-driven company wanted an interior that showcased their culture of innovation, digital technology and futuristic solutions. “Insiava has produced a number of first-of-a-kind technologies in Africa and their company is filled with young, ambitious and creative staff members,” said Janes Botha, Director of Black Canvas. To come up with a winning concept, Black Canvas studied the circuitry of microchip technology, as this is one of the technologies produced by Insiava. Their goal was to look at the intricacies of the solutions that the company develops and try to convey this in the interior design of the offices. One of the ways that Black Canvas was able to meet the client’s brief of combining creativity with serious engineering was through the flooring products. Belgotex’s monochromatic Prime range of carpet tiles, as well as their widely popular LVT planks, were specified. 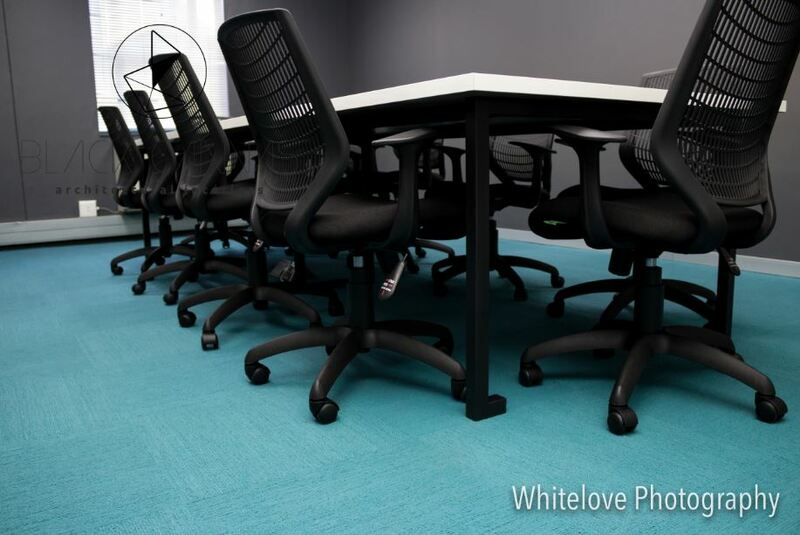 “We applied the Prime carpet range in bright aqua blue colour in spaces that we wanted to accentuate, such as the boardroom. Insiava wanted something unique and this interesting carpet tile helped us achieve this look. Many times, interior designers shy away from out-of-the-ordinary floors, but this is exactly what was needed for this project,” says Janes. “Belgotex is a well-established and dependable brand, but they are also unique in the creative solutions that they bring to the market. Their warranties and quality guarantees are in place and they have preferred installers, which make them a pleasure to do business with,” says Janes. The Prime carpet tiles added to the vibrant, future-focused look and feel that the Black Canvas team achieved. “With Belgotex, we knew we would be able to give the client an affordable solution that showcased the type of quality and aesthetics that the company produces through their technology. The flooring that was used helps to bring the culture of brainstorming, product development and collaboration to life,” concludes Janes. Monochromatic room design is where it’s at, which is why Belgotex has created a range of tiles that deliver an energetic kick of colour to the commercial space. The tiles are available in 10 great colours called Brilliant, Comedy, Dimension, Intense, Link, Rich, Sculptor, Tint, Vibrant and Volume. You can also choose to boost the look by colour-blocking the Prime palette to zone open-plan space, or merge it with a modern vinyl for contrasting texture. For more information, contact Belgotex on +27 (33) 897 7500 or via www.belgotex.co.za.